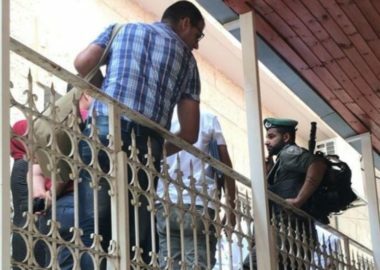 Israeli soldiers and employees of the Israeli Health Ministry invaded, Monday, a clinic run by the United Nations Relief and Works Agency (UNRWA) in the Sahera Gate area, in the Old City of occupied East Jerusalem. Eyewitnesses said the soldiers and health department employees invaded the clinic, and attempted to break into its pharmacy, allegedly to document the available medicines, their descriptions and usage in addition to the place of manufacturing. The invasion into the UNRWA clinic came just days after the Jerusalem City Council said it intends to shut down all UNRWA-run facilities in occupied Jerusalem. Jerusalem Mayor Nir Barkat announced that the Agency’s operations in Jerusalem would be shut down, although many Palestinians depend on UNRWA for medical, educational and food services. In response, UNRWA representatives said that the Israeli shutdown of the Agency’s operations is likely a violation of the agreements made between the Israeli government and the United Nations. In addition, they questioned Barkat’s motives in making this move, which comes just two months before he is scheduled to leave office. Barkat has also repeatedly expressed anti-Palestinian sentiments, and has taken a number of measures to discriminate against the Palestinian residents of Jerusalem and to force their removal. The Jerusalem City Council said it plans to shut down the UNRWA clinic in Shu’fat refugee camp, and in the Old City of occupied Jerusalem, under the allegation that the UN-run clinics were not licensed by the Health Ministry, and the patients “can receive services from Kupat Holim health maintenance organization. The Mayor claims that the 1,800 Palestinian students which attend UNRWA schools in Jerusalem would be “absorbed into existing schools”. But Israeli government schools are highly segregated, and those that are designated for Palestinians in Jerusalem are extremely overcrowded and underfunded already. The city government of Jerusalem made no indication as to how they would carry out this plan – and Palestinian residents fear that there is no plan, and they will be shut out of schools and medical care altogether. In addition, UNRWA provides trash service and cleanup for the refugee camp. With the Israeli government takeover, residents fear a backlog of garbage along with excessive fees being imposed on Jerusalem’s poorest residents. The mayor’s statement claims that UNRWA is “an illegal organization operating to advance terrorism and incitement”. But there is no evidence presented to back this bizarre claim. There is already a major shortage of classrooms, early childcare centers, medical clinics, maternity clinics, welfare and sanitation services in the Palestinian areas of Jerusalem. UNRWA has, until now, been able to provide some of the needed services for Palestinian refugees who live within the city of Jerusalem. With the shutdown of UNRWA, the refugees expect that they will simply end up being more neglected and unable to access medical care, education or sanitation. Attorney Nazreen Elayan told the Israeli paper Ha’aretz, “Instead of establishing infrastructure where needed, Barkat wants to take over existing infrastructure. We are fighting for years with the city to open more mother-child centers in East Jerusalem and it hasn’t done so. So now they’re going to take over the good clinics run by UNRWA”. And attorney Danny Seidman told reporters, “How can the mayor of Jerusalem declare war on a recognized international establishment that does no damage and is helpful? It’s all about theater, pure McCarthyism for the sake of Likud primaries”.